Originally a "T" code L6 car, it is now a 289 V8 clone with factory air, top loader 4 speed, black leather bucket seats and a beautiful candy apple red paint job. This Mustang is the ultimate cruiser with many drivability upgrades on it. The interior is very comfortable and complete with factory oil pressure, fuel, amps, temp and speedometer gauges. The A/C and aftermarket radio are a nice touch and allow you to drive this car anywhere in comfort. The 289 with the headers paired to the 4 speed are a great combination and very steerable. You can drive this car with confidence as the entire suspension has been rebuilt and the front has been upgraded to disc brakes making the car very safe. The fresh candy apple paint job is beautiful and makes this car a sight to see anywhere you take it! The 1966 Mustang debuted with moderate trim changes including a new grille, side ornamentation, wheel covers and gas cap. Ford's new C-4 "cruise-o-matic" three-speed auto transmission became available for the 225 hp V8. The 289 "HiPo" K-code engine was also offered with a c4 transmission, but it had stronger internals and can be identified by the outer casing of the servo which is marked with a 'C'. The long duration solid-lifter camshaft that allowed the high revving 289 to make the horsepower it was known for, was not friendly for a low stall speed automatic torque converter. The "HiPo" could be spotted very easily by the 1-inch-thick vibration damper, (as compared to 1/2 inch on the 225-hp version) and the absence of a vacuum advance unit on the dual point distributor. With the valve covers off, there is a large letter "K" stamped between the valve springs, along with screw in studs (vs. a pressed in stud for other 289s) for the adjustable rocker arms. A large number of new paint and interior color options, an AM/eight-track sound system, and one of the first AM/FM mono automobile radios were also offered. It also removed the Falcon instrument cluster; the previously optional features, including the round gauges and padded sun visors, became standard equipment. 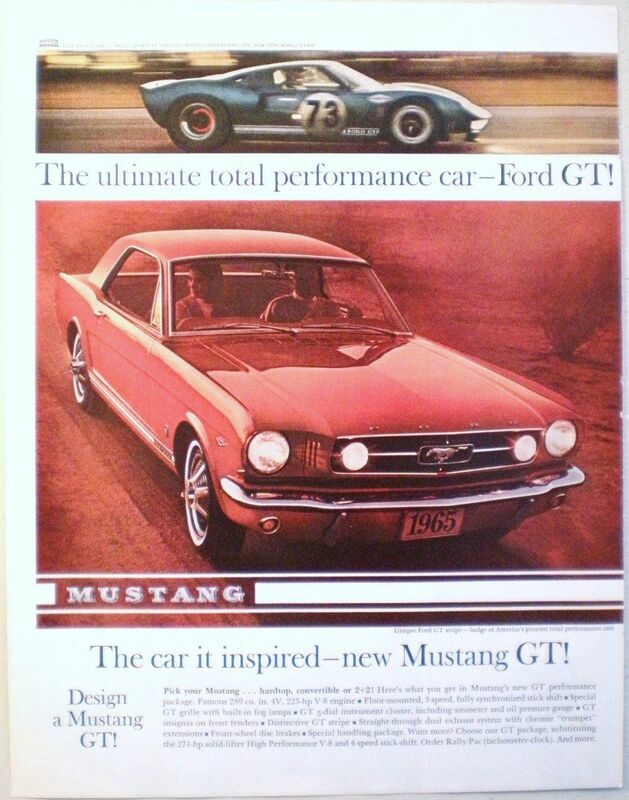 The Mustang would be the best-selling convertible in 1966, with 72,119 sold, beating the number two Impala by almost 2:1.